The Tilt Board v3 has two functions. 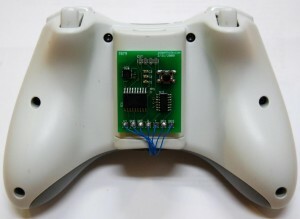 The main function of the Tilt Board is to use the tilt of your Xbox 360 controller as an input to the Xbox 360. The Tilt Board uses an accelerometer that measures the force of gravity on each axis to determine the tilt of the controller. The tilt of the controller is then output through the Xbox 360 controller analog stick input. Both the X and Y axes are used. The secondary function of the Tilt Board is to control the digital push buttons on the Xbox 360 controller. The Tilt Board can sense a sudden jolt of the Z axis (vertically up/down) and activate a digital button of the Xbox 360 controller when the jolt is sensed. For example, if the controller is jolted down it could activate the “A” button. Accelerometer XY – This is the default operating mode and both the X and the Y axes are controlled by the accelerometer. 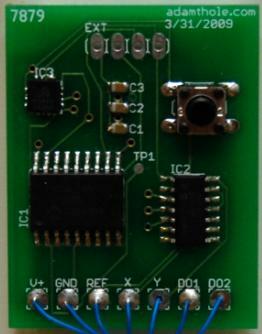 Potentiometer XY – In this mode the accelerometer is not used for input at all and the Xbox 360 analog stick functions normally. Potentiometer X – In this mode the Y axis is controlled by the accelerometer, and the X axis is controlled by the analog stick on the Xbox 360 controller. Potentiometer Y – In this mode the X axis is controlled by the accelerometer, and the Y axis is controlled by the analog stick on the Xbox 360 controller. Digital Output 1 (DO1) – The Xbox 360 digital button that DO1 is connected to will be activated when a jolt of the Z axis is detected. Digital Output 2 (DO2) – The Xbox 360 digital button that DO2 is connected to will be activated when a jolt of the Z axis is detected. so man!!! !when you relase ther code?and ..when you release the pcb layout!!!?? ?